In Cascade Springs, New York, Violet Waverly and her grandma, Daisy, are the proprietors of Charming Books, where the power of the written word is positively enchanting . . .
October in Cascade Springs means tourists are pouring in for the annual Food and Wine Festival, and Daisy hopes to draw those crowds to the store. She asks Violet and the local writing group, the Red Inkers, to give a reading of the works of Edgar Allan Poe on the shop's front porch to entertain the revelers. Everyone eagerly agrees. Yet their enthusiasm is soon extinguished when Violet discovers one of the writers dead in the shop moments before the event. 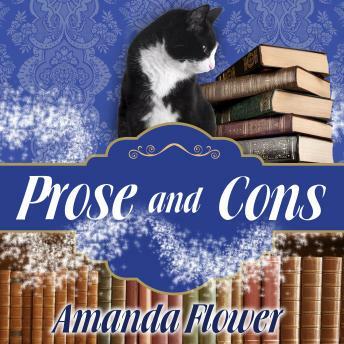 After the shop magically tells Violet she'll need to rely on Poe's works to solve the murder, she enlists the help of her trusty tuxedo cat, Emerson, and the shop's crow, Faulkner. But they must act fast before someone else's heart beats nevermore . . .